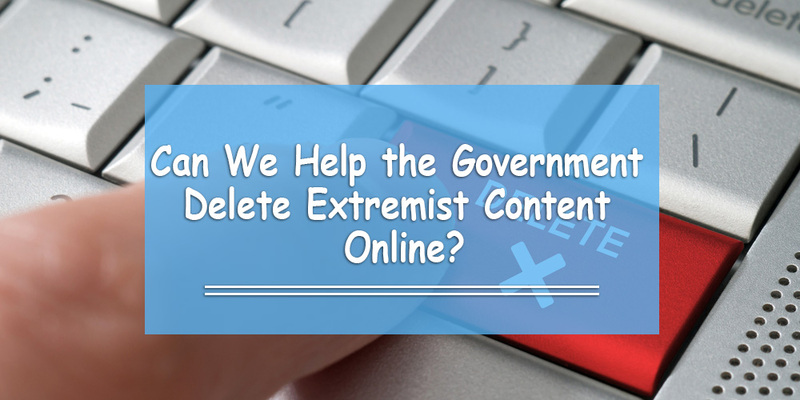 Can We Help the Government Delete Extremist Content Online? Question: how many posts by online extremists do you think are online each week? How many posts might you come across if you were simply browsing through the Internet? …And that’s just the ones they find! In an effort to promote counter-terrorism efforts, the CTIRU currently works with over 300 Internet service providers (ISPs) to have the material removed. CTIRU representatives go through massive amounts of content looking for harmful material that breaches their terms and conditions by law. Removing this material is crucial work. One post or video has the power to influence a vulnerable people and inspire extremists and terrorists, so every removal really counts. What Are Some of the Things They Found? Several journalists report about a propaganda video made by a terrorist group showing a child holding a gun to a man’s head with his face covered. In the video, the child encouraged viewers to stab people with knives bought from their local grocery store. Several extremist organizations attempt to radicalize vulnerable adolescents by posting other forms of harmful material. These include photos of executions, propaganda videos, and speeches calling for racial and religious violence. The public has played a key part in helping us to identify and seek the removal of so much damaging material, so I thank everyone who has reported material to us and urge the public to continue doing so. The counter-terrorism unit has a simple process for anyone in the UK who comes across this: fill out a form and enter the link (URL) of the webpage where they find the material. Citizens of the GCC need to be able to do this, too. We need access to a link on the web that enables us to send information to government authority figures. Once they receive information from us, the can work with our Internet service providers (Etisalat, Zain, Wafai Net, etc.) to eliminate this extremist content from the web.